The basic unit of Usenet news is the article. This is a message a user writes and “posts” to the net. In order to enable news systems to deal with it, it is prepended with administrative information, the so-called article header. It is very similar to the mail header format laid down in the Internet mail standard RFC-822, in that it consists of several lines of text, each beginning with a field name terminated by a colon, which is followed by the field's value. Articles are submitted to one or more newsgroup. One may consider a newsgroup a forum for articles relating to a common topic. All newsgroups are organized in a hierarchy, with each group's name indicating its place in the hierarchy. This often makes it easy to see what a group is all about. For example, anybody can see from the newsgroup name that comp.os.linux.announce is used for announcements concerning a computer operating system named Linux. These articles are then exchanged between all Usenet sites that are willing to carry news from this group. When two sites agree to exchange news, they are free to exchange whatever newsgroups they like, and may even add their own local news hierarchies. For example, groucho.edu might have a news link to barnyard.edu, which is a major news feed, and several links to minor sites which it feeds news. 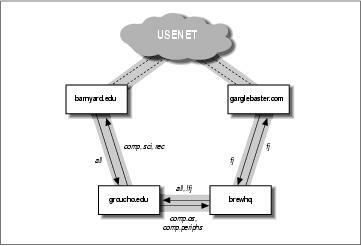 Now Barnyard College might receive all Usenet groups, while GMU only wants to carry a few major hierarchies like sci, comp, or rec. Some of the downstream sites, say a UUCP site called brewhq, will want to carry even fewer groups, because they don't have the network or hardware resources. On the other hand, brewhq might want to receive newsgroups from the fj hierarchy, which GMU doesn't carry. It therefore maintains another link with gargleblaster.com, which carries all fj groups and feeds them to brewhq. The news flow is shown in Figure 20-1. The labels on the arrows originating from brewhq may require some explanation, though. By default, it wants all locally generated news to be sent to groucho.edu. However, as groucho.edu does not carry the fj groups, there's no point in sending it any messages from those groups. Therefore, the feed from brewhq to GMU is labeled all,!fj, meaning that all groups except those below fj are sent to it. Netnews Up How Does Usenet Handle News?